Soak the chickpeas in 3 cups of water and 3 tablespoons coarse salt for 12 hours. Drain and rinse. Use right away or freeze for later use. Cook the chickpeas either stovetop (about 1-2 hours), pressure cooker (40 minutes dried or 20 minutes soaked or brined) or, for the smoothest texture, in the slow cooker (4 hours on high or 8 hours on low). Drain the chickpeas, reserving ¼ C of the pot liquor. Stir the tahini in the jar to make sure it is well blended. 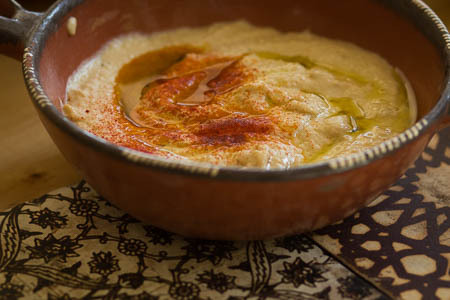 Place the tahini, garlic, lemon juice and cumin in a blender or food processor and blend until the mixture “whitens.” With the machine running, add the reserved pot liquor. Add 1 ¾ cups peeled chickpeas (reserving some whole ones for garnish if desired) and process until smooth and glossy. Taste and adjust seasoning with salt and lemon juice. Allow to mellow at room temperature for 1-2 hours. To serve, place on a plate and flatten out the spread, making a small well in the middle. Pour in the olive oil and sprinkle with sumac or za’atar as desired.